Single site laparoscopic cholecystectomy is one of the more commonly performed single site/access surgeries today, and is successfully accomplished with a variety of different techniques. Single site surgery presents some unique challenges, and a number of surgical devices and instruments have been introduced to resolve some of the challenges of single site surgery. However most devices utilize rigid or semi-rigid instruments, require multiple fascial punctures, and allow only limited or difficult triangulation. The TransEnterix SPIDER system introduces a new concept in minimally invasive surgery, flexible endoscopy, aimed at resolving these obstacles to single site surgery. Through an innovative flexible instrument delivery system, the SPIDER can overcome many of the challenges of single site surgery by eliminating the need for “criss-crossing” of instruments to achieve true surgical triangulation, minimizing tissue trauma and allowing surgery through a truly single, 18-mm incision site. The effectiveness of this surgical device has previously been reported in a porcine model, and human data is now becoming available. 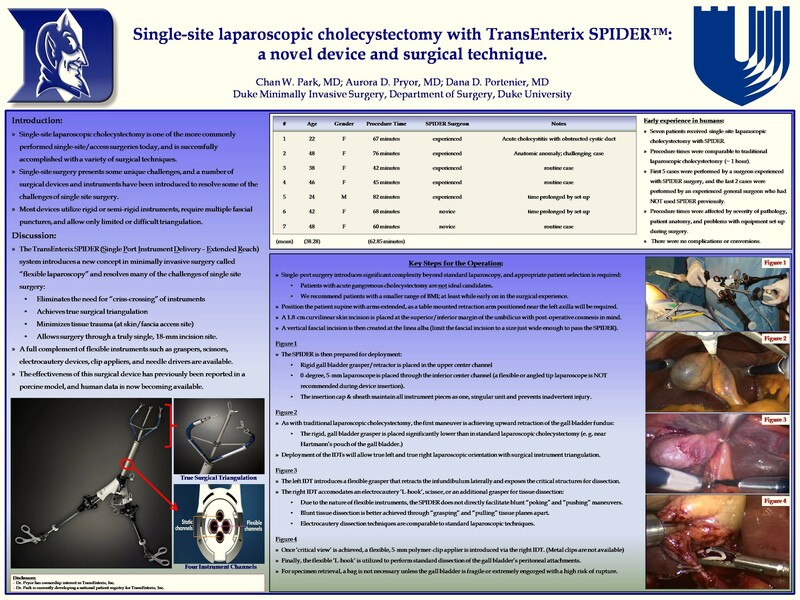 This study outlines the techniques of performing successful single site laparoscopic cholecystectomy with the SPIDER and discusses methods to troubleshoot some common challenges that may confront the surgeon during the procedure.